Do you have what it takes to help the Wedding Wishing Well Foundation reach its full potential? Are you passionate about fundraising? The Wedding Wishing Well Foundation is looking for a Fundraising Co-ordinator, and that may just be you. Please keep reading for a full job description – we’d love to hear from you. Hours and pay are negotiable for the right candidate. Candidates must have excellent verbal communication, written communication, and sales ability, as well as the drive to succeed. However, due to the nature of the work that we do, the candidate must also be compassionate and hold a high level of understanding. The position involves outbound calling/recruiting local business and community leaders, through telephone sales, to volunteer/participate in local fundraising events. Therefore the candidate must have a friendly and professional speaking voice with strong phone etiquette skills, positive and energetic attitude, and strong desire to meet goals and commitments. This position requires between 10-40 hours a week, Monday-Sunday from 9-4:30pm. Flexibility is offered, however some hours will be at weekends due to the nature of the position. The salary will be based on the hours taken and the candidate’s experience. Computer skills and experience with Microsoft Office and Dropbox is very helpful, while experience with social networking is advantageous. The position will have a probation period. Under general directions and supervision, the Fundraiser Coordinator is responsible for independently conducting the day-to-day operational management and implementation of all activities pertaining to fund development and fundraising. – A reasonable quota will be established that needs to be met. – The Fundraising Coordinator will help obtain funding by drafting, editing, and preparing grants for submission. This also includes compiling program related reports and submitting them in a timely manner. – Must have the skills and potential to excel in this position. Information Management: Treats all information and data within the scope of the position with appropriate confidentiality and security. Safety Requirements: Knowledge of, and observes and complies with office safety policies and emergency procedures. Knowledge and Education: Some college or a degree in a related field or equivalent work- experience. If minimal education requirement is not met, then candidate should apply if they feel they have the skills and potential to excel in this position. Only shortlisted applicants will be informed, and this will be by 19th May 2014. Those shortlisted will be asked to present a PowerPoint presentation, minimum of 5 minutes, in support of their application. Interviews will take place in Exeter on Tuesday 10th June 2014. Expenses will only be refunded for the overall successful applicant. Please apply in writing with a full covering letter and a copy of your CV, as well as a supporting statement telling us why you would excel in this position. Closing Date Monday 12th May 2014. Good luck! We look forward to hearing from you soon. Here it is; another round up of what’s been going on recently, as well as a little inspiration for your own fundraising efforts. We’d like to start by saying a big ‘thank you’ to Mark at Evolve Photo, a south west-based wedding photographer, for his fantastic donations this month. It really does add up, and it means so much that local wedding suppliers take the time to support us. Sarah Middleton, we salute you! Sarah recently ran the Plymouth Marathon in aid of the Wedding Wishing Well Foundation, and we couldn’t be more pleased, or proud. To read about Sarah’s motivations, please click here – it isn’t too late to donate, either. Simply follow our PayPal link to make a quick and easy donation. Fancy donning your running shoes in our honour? There are still places remaining for the Torbay Half Marathon, so why not sign up today? Don’t forget our charity abseil; applications are coming in thick and fast, so don’t miss out. Of course, you’re more than welcome to come up with your own fundraising ideas; we’d love to hear from you! This is just a little reminder that you can read Naomi’s new column in Every Avenue Wedding Magazine, which is available to read here. Every Avenue is a fantastic online wedding magazine, which is packed with new trends, hints and tips, inspiration, real weddings, competitions, and more. The magazine is completely free to view, although the lovely team do ask that, should you enjoy the publication, you make a small donation of £1 to the Wedding Wishing Well Foundation – we are so grateful for their support. Keep your eyes peeled for the next edition, which should be available at the beginning of June. Follow in Naomi’s Footsteps – On your bike! Our founder, Naomi, has never been one to sit back and let everyone else have all the fun. In fact, she’s so keen to get in on the action that she has taken it upon herself to complete an 11-mile cycle challenge on 26th May. Well, we’d rather her than us!! On a serious note, this is a massive challenge for Naomi. As you’ll be aware, she has incurable secondary Breast Cancer, which is now present in her pelvis and spine. This causes immense strain on her back, and will make riding a bike incredibly painful, let alone for 11 whole miles. If you factor in that Naomi last took to the saddle 15 years ago, you will get some idea of what an immense challenge this will be for her. You can help to give her the push that she needs to keep going by donating, no matter how small the amount. Please see here for more information and to make a donation. Naomi has managed to raise over £100 so far, all thanks to your generous donations. That amount would cover a cake and car hire for one of our couples, so every penny really does make a difference. There are also spaces available for this year’s London to Paris cycling event – not one for the faint hearted! There are two further trips running this year; the first is 13th-17th August, while the second is 3rd-7th September – If you think you’ve got what it takes, please do email Naomi on info@weddingwishingwell.org.uk. To view more of our upcoming cycling events, please click here. 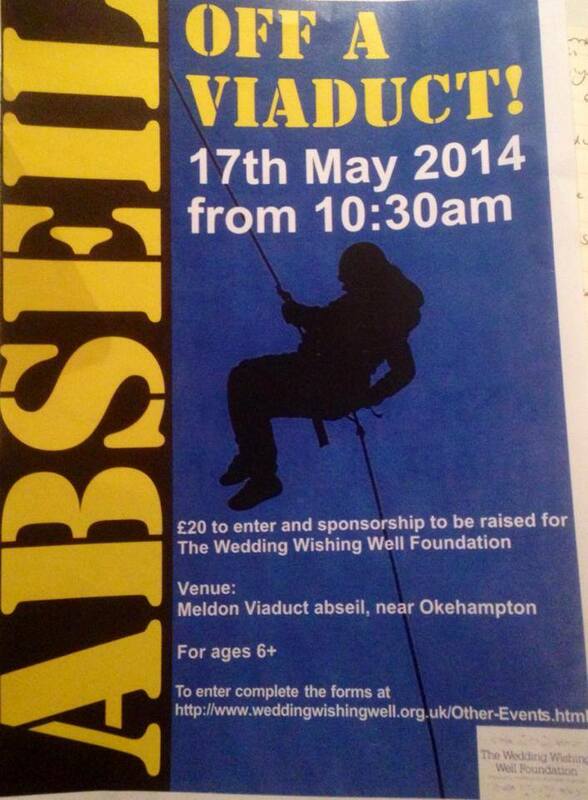 Sign up for our abseil! If you fancy raising some cash for The Wedding Wishing Well Foundation and have a head for heights (or even if you don’t! ), be sure to register for our charity abseil, which is due to take place at Meldon Viaduct on 17th May 2014. This fantastic event will give fundraisers an exciting opportunity to scale an impressive viaduct, which dates back to 1874, as well as taking in some beautiful countryside views. Hurry though, entries will be closing on 10th May 2014. For further details, and for the registration and medical forms, please visit this page. Details of similar fundraising events can be found here. The Wedding Wishing Well Foundation is delighted to have the support of Confetti.co.uk, the UK’s leading bridal website. We strongly suggest you check out their site for some truly stunning wedding ideas, real weddings, planning advice, supplier information, and competitions; you’ll find inspiration, online shopping, and planning advice in one easily accessible place. 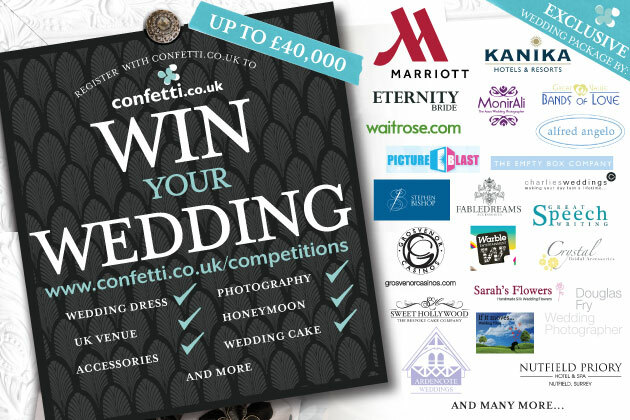 We are extremely excited to tell you about an amazing competition that Confetti is currently running, in which brides and grooms have the opportunity to win their entire wedding, worth up to £40,000. The competition features exclusive prizes from top suppliers across the country, including Marriott Hotels, Kanika, Eternity Bridal, Alfred Angelo, Stephen Bishop Suiting, Warble Entertainment, and more, as well as a fantastic honeymoon at the Olympic Lagoon Resort. The competition is completely free to enter, so what do you have to lose?! Simply visit Confetti.co.uk to register. For full competition rules, as well as details of the amazing package on offer, please click here. To read the fabulous article that Confetti put together for The Wedding Wishing Well Foundation, please click here. Once again, we are so pleased that they have chosen to support our cause. We are delighted to announce that The Fellowship of Professional Celebrants has chosen us as their Charity of the Year 2014. This brilliant organisation offers professional networking and support for independent celebrants, including those who officiate weddings, funerals, vow renewals, and naming ceremonies, as well as providing training courses to those interested in pursuing a career in any of these fields. During the past three years founder and director Terri Shanks had donated just under £10,000 to several deserving charities, helping them to continue their valuable work. The Fellowship’s support means a great deal to us, and we can’t wait wait to work alongside them this year. Terri is passionate about giving back to her community and further afield and makes a donation for every new celebrant to join the Fellowship, inspired by her own personal journey to find her adopted brother, who unfortunately passed away before they could be reunited.